Okay, just kidding. But I am loving life in Vire. 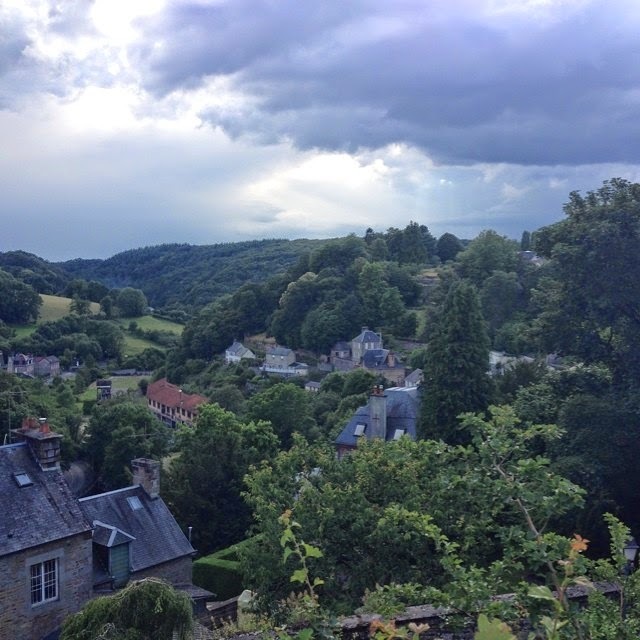 Vire is the cutest little, French town that I have ever been to and I have seen quite a few cute, French towns. I came Monday morning with my professor, Dr. Elliott, to research a famous 18th century French writer, Madame Le Prince de Beaumont. She is most famous for her many, many books and pamphlets that focused on educating women. She also wrote a number of novels, one including the famous Beauty and the Beast. Here in Vire at the local library, they house her personal, actual, real, over 300 year old letters. That I touch. With my (properly gloved) hands. Reading, cataloging, and attempting to translate her personal letters has been overwhelming, but so incredibly cool. Reading her personal letters and manuscript notes is definitely hard work (these letters are hundreds of years old and are hard to read - plus they're in French), but unlike any experience I have had thus far. And did I mention how cute Vire is? It's a small town in the region of Normandy where it mostly rains (yet it has been sunny for us the past few days), but has the friendliest people. The food here is amazing. So much goat cheese. On all the things. I love it. It has also been a great experience to venture out of Strasbourg and into a smaller and more quaint town. I can definitely tell I am a small, French town kind of girl. Now while I've had a blast in Vire, I can't wait to begin my next adventure in Paris on Thursday. Tomorrow is my last day in Vire (don't remind me) and my last day doing my research on Beaumont's letters. Prayers for safe travels Thursday will be much appreciated. Oh hey beautiful, French country side. NBD. Study Abroad is Over, but the Journey Continues! Luggage, Cheese, and Bread...SO GOOD!